North Carolina's standing as a venue for championship-level collegiate sports has taken another hit because of House Bill 2. The Atlantic Coast Conference announced today that it will move 10 championship events out of North Carolina this year - including the ACC football championship game that was scheduled for December 3 in Charlotte. Mayor Jennifer Roberts says it’s frustrating that the ACC included Charlotte in its decision since the city passed LGBT protections that lawmakers overturned with the passage of HB 2, which limits protections for LGBT people. “We know that our reputation has been damaged. We know that Charlotte has stood up for the right thing, stood up for equality, yet we are in a state that has preempted that,” Roberts said. The ACC decision comes two days after the NCAA said it is pulling seven championship events from North Carolina because of House Bill 2. The Greater Raleigh Sports Alliance recruits and hosts many of these events. The group’s executive director, Scott Dupree, calls the moves "disappointing" and damaging. 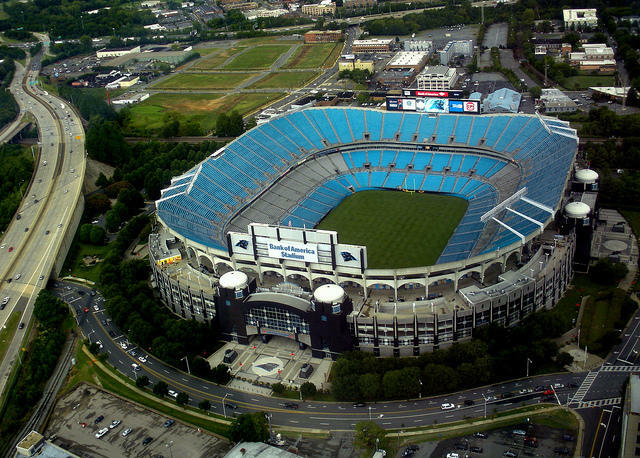 This year's ACC championship football game will not be played at Bank of America Stadium. "In terms of the sports event industry in North Carolina, this is an historically bad week and an unprecedented week in terms of lost business and damage to our reputation and brand as a great state for sporting events. " The NCAA’s decision hits especially hard in the city of Cary near Raleigh, where four of the planned events would have been held - including the Division 1 Women's Soccer championship in December. Cary will also lose tennis, lacrosse and baseball championships that were scheduled for spring. The city has worked hard to brand itself as an amateur sports destination.